Despite having watched X-Men:Apocalypse in a brand new, state of the art movie theater opening weekend, there were still new details and graphics coming through the 4k resolution. X-Men:Apocalypse is the latest in the highly successful X-Men franchise. According to Bryan Singer, the director, and one of the producers, X-Men:Apocalypse follows X-Men: Days of Future Past by bringing in the Egyptian scenes in the very beginning. Apocalypse was the forefront of civilization and demands worship. As he grows old he transfers into younger beings. He wipes out the civilizations once they grow tired of worshipping him. This time, he believes that he has found the ultimate mutant to transfer into and what he thinks is the ultimate civilization to control. It's a battle of Mutant versus Mutant, and each must take a side. It is interesting to watch how Storm develops her psyche and ends up on the winning side and ultimately becomes a member of the X-Men. While it is the same characters as in the predecessor films, the different aspects of each one of the Mutants are explored and you feel as if you are getting to know the characters for the first time, while they are trying to save not just the world, but civilization as we know it. This is the first Blu-ray that I have watched on 4k and I am running out to the electronics store to buy a new television set. The 4k (2160p) with an aspect ratio of 2.40:1 is amazingly crisp and clear. Despite having watched X-Men:Apocalypse in a brand new, state of the art movie theater opening weekend, there were still new details and graphics coming through the 4k resolution. John Dykstra, the Visual Effects Supervisor, who actually did the original Star Wars film, did a superb job and the effects really come through on the 4k resolution. The audio is presented in Dolby TrueHD 7.1 (48kHz, 24-bit). The sound quality is amazing and is also much clearer than even the movie theater version. You can actually hear all the timbre and emotion in the voices of the actors. - Audio Commentary of the movie of over two (2) hours worth hosted by Bryan Singer and Simon Kinberg, a producer and screenwriter. - Concept Art showing the progression of the characters and locations, as well as Unit Photography, featuring the characters in actions. There is also a Cast and Crew section, where the cast is listed down the left hand side of the screen. As you click or highlight on a name, the right side will show the movies in which that actor has performed. It's interesting to watch the Wrap Party Video, which is usually not featured on a Blu-ray extra. Watching the Gag Reel makes me wonder, with all the intentional jokes made by the actors themselves during filming, how they ever get done filming. Nonetheless, the audio commentary is absolutely amazing. If you want to watch just the movie and hear the dialogue, then don't start with the audio commentary, but I highly recommend watching this at some point. I loved hearing the dialogue between the director and the producer/screenwriter as to why certain scenes were put in and why characters were doing certain things. It provided such an insight- more so than any Blu-ray feature I have seen previously. If you want to know the why and the how, this is a must-see feature. Download X-Men: Apocalypse from the iTunes Store in Digial HD. 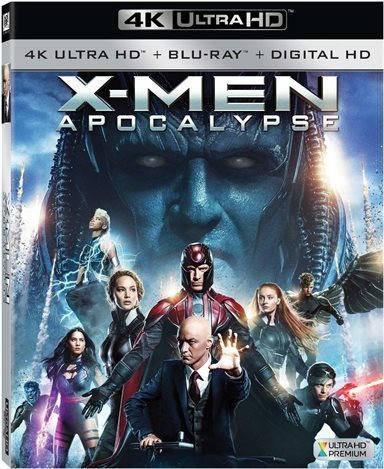 For more information about X-Men: Apocalypse visit the FlickDirect Movie Database.